The torrential rains have stopped but not the ill-will effects from the over abundance of it over the once drought-ridden State. 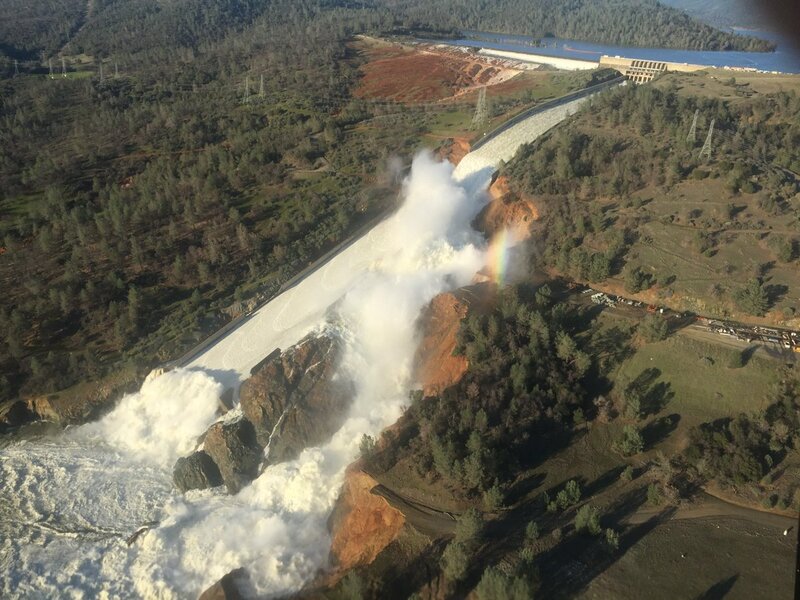 Too much of a good thing has this State reeling from the damage from flash flooding, land and mudslides to today where the secondary spillway at the Lake Oroville Dam has created a much bigger problem. 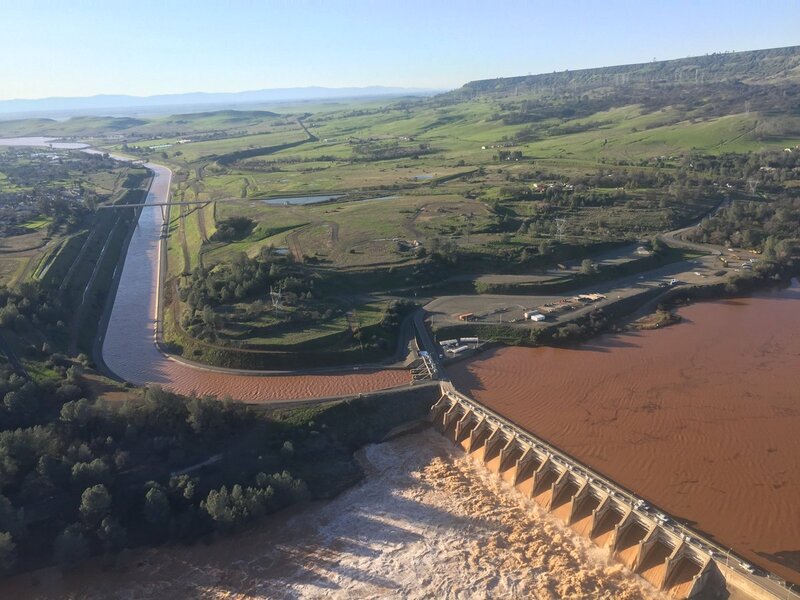 Too much water flowing quickly over the dam causing management to allow water to flow to a secondary spillway. That does not sound all that too bad, does it? It is actually frightening to know that the California Department of Water Resources is using the secondary spillway the first time in its 49-year history. Due to the extreme fast rising water, it has exposed a breach in its construction and now it is about to fail. This could spell catastrophic for those downriver, therefore we are today covering news about a mass evacuation in the City of Oroville and Palermo, California. Here is a compiled list of what is happening in each City and County in California. Evacuation Info (for residents): Butte County Sheriff Office, 530-872-5951. Hospital: Oroville Hospital is NOT evacuating. Shelter: Alliance Church on Clark Road. For people and small animals. Shelter: Camelot Equestrian Park,1985 Clark Road. For people and large animals. Staging: Butte County college for both Fire/PD. Oroville Dam (R) and secondary spillway (L). Credit: CA DWR. Red Cross Shelter: Silver Dollar Fairgrounds, 2357 Fair Street, (small animals accepted). Shelter: Neighborhood Church of Chico, 2801 Notre Dame Blvd. (no animals inside). Shelter: St. Johns Episcopal Church, 2341 Floral Avenue, Chico (small animals accepted if leashed and crated). Shelter: Colusa County Fairgrounds. 1303 10th Street. Shelter: Rolling Hils RV Park. (10 spaces left, can take large animals at equestrian center). Fish Hatchery: Massive water flows on the Feather River. Hatchery fish rescued and secure . Shelter: Glenn County Fairgrounds, 221 E. Yolo St. Orland, CA (accepting livestock, no small animals, 40 RV sites). Shelter: Nevada County Fairgrounds is currently sheltering 143 people. 150 people are waiting for a cot. Shelter: Glenn County Fairgrounds. 221 E Yolo Street. Hospital: Oroville Hospital is open for emergency patients only. No one has been evacuated from the hospital. If not an emergency, go to another hospital. Sheriff Office: Assisting with mandatory evacuations. Shelter: Elks Lodge 1100 Elks Lane – (no small animals accepted, RVs allowed in Parking Lot). Mutual Aid: SD Swift Water Rescue team activated. Waiting for orders from state and will deploy to Butte Cty when directed to do so. CA Dept. of Water Resources (DWR): @ 1650 PST. Alert given to residents for mandatory evacuations Northward due to structure integrity of secondary spillway has some erosion and it was due to have an epic failure, cause mass flooding downstream. 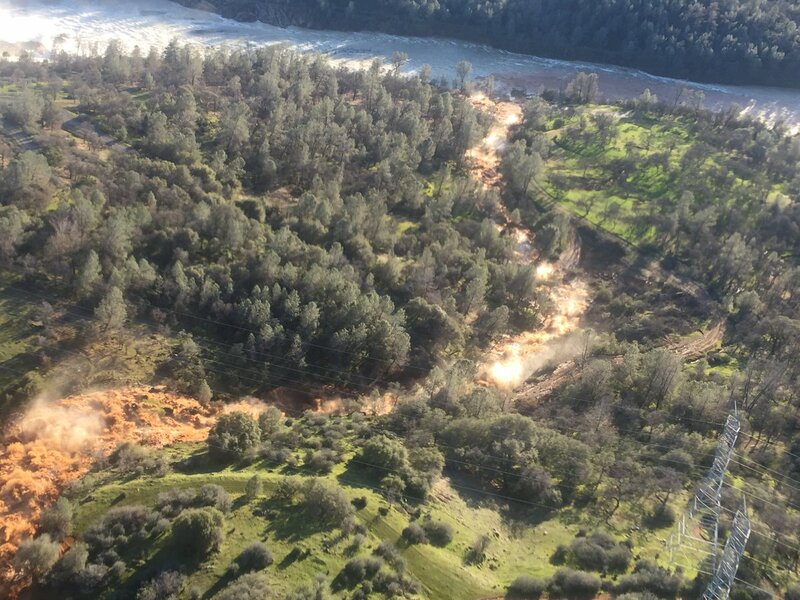 State of Emergency: Governor Brown Issues Emergency Order to Help Response. Task Force: Sacramento Fire personnel staffing swift water rescue equipment have departed for Oroville area, will be ready if needed. Credit: CA DWR taken on 2/12/2017. Southbound Highway 70 is being shutdown. PLEASE HEAD NORTH. DWR needs to lower the lake level by another 50 feet to prepare for the incoming storms. Credit: CA DWR. Taken on 2/12/2017. Evacuations: Unknown when mandatory evacuations will be lifted. More updates will come as information is received. Another update is due to be published tomorrow evening. A massive fire ripped through a City block of structures that included a former church on Berkshire and Vandine Streets in Cambridge, MA, an area that is home to almost 110,000 residents. Firefighters were called around 2:52 PM EST (or 11:52 AM PST Seattle time) to a structure fire. A second alarm was requested at 2:57 PM EST then at 2:58 PM EST struck a 3rd alarm. Then a 4th alarm was requested at 3:03 PM EST. 5th Alarm was called immediately for more manpower and resources at 3:05 PM EST. We picked up Scanner Feed when the alarm had already reached 10. We have never seen such a high alarm number but when you are dealing with multiples numbers of people in grave danger, a densely populated area, an inferno of flames and several cars and structures involved, you need to draw from every resource available possible. All in all, there were about 140 Firefighters working at the peak of the fire from 17 Fire communities. There were 2 Police Officer, 1 Firefighter and 1 Civilian injuries reported. There were no fatalities. 120 people were rescued. 8 buildings were severely damaged including a former church. War Memorial Center, 1640 Cambridge Street, Cambridge, MA. 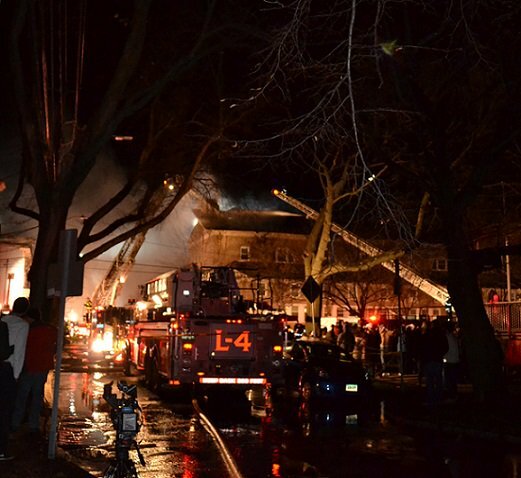 The City of Cambridge Mayor, E. Denise Simmons set-up a GoFundMe account to raise $200,000 for victims and those impacted by today’s massive fire. So far the fund has raised $50,000 by 847 donors in just five (5) hours. They still need your help. 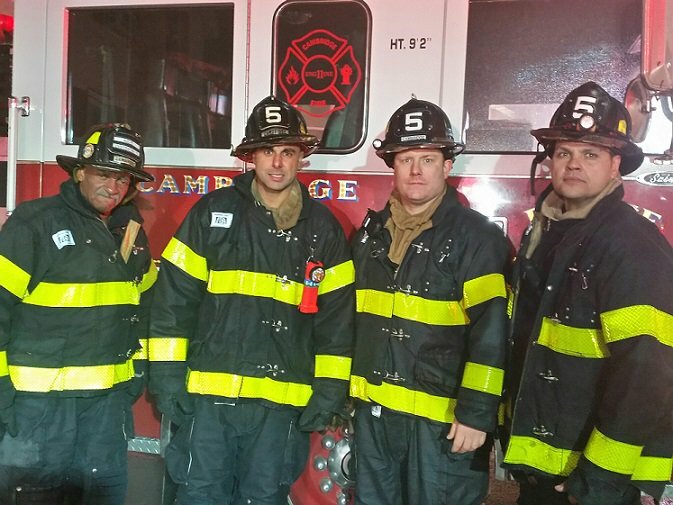 You can still help by going to the (Cambridge MA) Mayor’s Relief Fund on Go Fund Me at https://www.gofundme.com/cambridge-mayors-fire-relief-fund and donate to help those impacted by this fire. Here is what those in the Fire Service, Media, Social Media users and others in general are saying via Social Media sources. Facebook activated its Safety Check app for those involved or impacted by today’s fire. 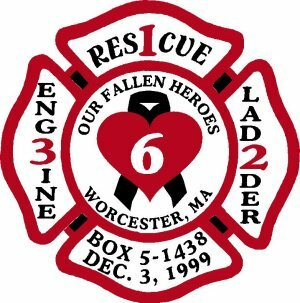 As this intense fire raced from house to house in a densely populated area, we were reminded by 6 Worcester firefighters who lost their lives today back in 1999 during firefighting efforts in the Worcester Cold Storage Warehouse. Cambridge, Massachusetts is home to two major colleges Harvard and MIT and a place where those come to work/live and play. As of 2014, there were approximately 109,694 people who live in this beautiful City located directly North of Boston and across from the Charles River. As with any large City, they are a self-sufficient metropolitan area with Police, Fire, City Hall, Utilities and additional fun entertainment in the area. 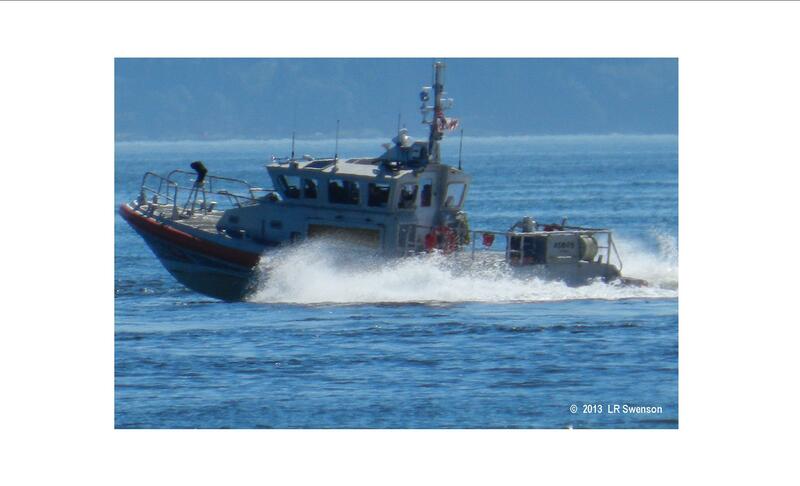 You can find us here on our Blog, Twitter (@nwfireblog) or on Facebook. We’d love to have you join and follow us. May you have a Safe day/evening wherever your journey make take you. A massive fire is burning a multitude number of structures and vehicles on Berkshire and York Streets near Kendall Square in Cambridge, MA. Here is the gist of what we know so far, after hearing information live on scanner feeds and gleaning from various sources. At the time we began picking up scanner feed, the fire had been well developing forcing the IC to ask for more resources and causing the alarm to be elevated to a 10-alarm fire. You never hear a 10-alarm which tells those of us in the fire business , this is very intense fire. In this case, there are approximately 8 buildings on fire with 3 towers, 3 ladders, multiple hose lines and master streams. Fire Officials stated in addition there were significant fires in 2 buildings. All Companies were working. There are many accounts by users on Social Media so we are going to just stick with the facts but we are posting information from Fire Officials, news media (mainstream) and via the public. Evacuations: Residents in fire area evacuated. Damage Assessment (Preliminary): 1 building collapse. – Media; Partial roof collapse of Church – Fire scanner feed. Nampa PD – Nampa ID – Closing Date not Listed. $17.30/hourly. http://boise.craigslist.org/gov/5161305092.html. City of Everett PD – Everett, Washington – Closes 9/18/15. $5346/ monthly. http://seattle.craigslist.org/sno/gov/5156046568.html. Okay, we’re a little partial to these fun wedding proposals – Firefighter style. Who knows? We know some of you may not approve of using Department apparatus or equipment during these “proposals” so we ask that you just enjoy these awesome clips with the rest of us. We love every single one of them. Thanks to those who shared them on YouTube.com. We appreciate you opening up your special moments in your life with the rest of the world. May you all have happy long lives together. In 1962, U.S. President John F. Kennedy signed a proclamation designating May 15th as Peace Officers Memorial Day and the week it falls on as Police Week. 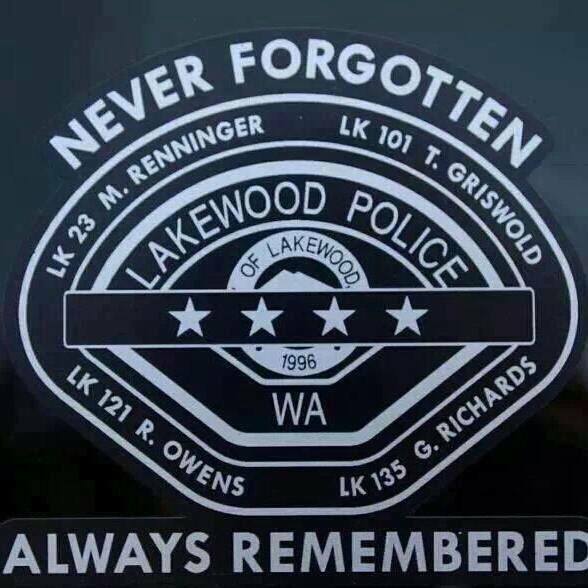 The Memorial Service first began on May 15, 1982, when 120 survivors and supporters of Law Enforcement gathered together in Senate Park during a time of reflections. An event held in Washington D.C. is host to between 25,000 and 40,000 those in Law Enforcement from Departments around the United States and globally. It’s a perfect opportunity to meet with one another who share the common thread of brother/sisterhood. This year, more than ever – we find this to one of the best chances to share your stories with one another, help support each other and to network with Departments. 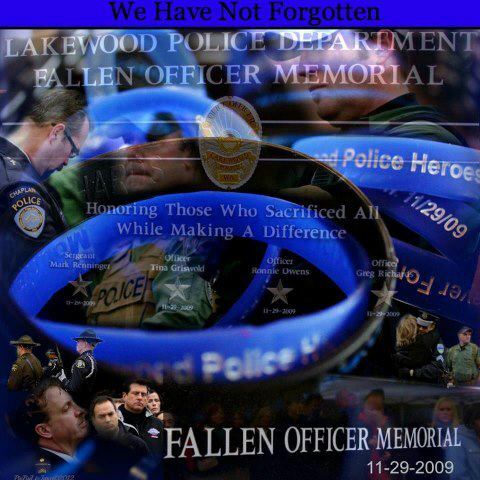 There have been too many Officers targeted and killed in the Line of Duty. This is the chance of a lifetime to visit in D.C., tour this great City and celebrate in unison National Police Week. The Grand Lodge of Fraternal Order of Police will be host to the National Peace Officers Memorial Service and the Fraternal Order of Police DC Lodge #1 will be Sponsors of receptions in the afternoon and evenings during Police Week. 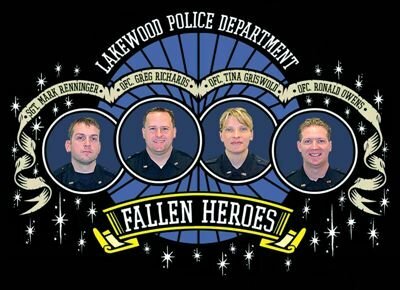 To find out more information, go to the Event’s website at http://www.policeweek.org. In Honor those Killed in Action, please fly a “BLUE” ribbon on your car antenna to show your support for Police Week. Lewisburg, WV | Since the Ferguson and New York no convictions for the Officer-involved shootings were handed down by the Grand Jury in late November 2014, Police Officers all across the United States have become targets by the criminal population acting on a golden opportunity they say is their due right. We, however completely disagree with that statement and today shows the implications of a criminal’s decision to act upon that decision. Approximately, sometime shortly before 1630 EST in Lewisburg, WV, two police officers were shot with one taking a bullet to his vest and causing rib injuries. The second Officer was flown to a [unknown] hospital with an undisclosed condition. Media sources are reporting both will be okay. The details of the incident are somewhat sketchy, but here is what we’ve learned so far. One arrested and in custody. Second suspect, Mike Maynor [name provided by media source], Middle Eastern descent, black hair, black jacket fled the scene in a red Chevy Silverado 1500 last seen around 1630 in Green Sulphur Springs. The truck’s plate is MP3612 was later found two miles outside of Lewisburg. The second suspect is being sought by police. If you see the suspect, do not approach but call 9-1-1. This person is considered armed and dangerous. The City Police Department patrols and provides services to a six-mile area to approximately 4,500 residents. Their Agency has twelve full-time sworn LEOs, one receptionist, one Municipal Court clerk and two Municipal Court Judges. 9-1-1 Dispatch Center is a county operated facility in Greenbrier County which handles 15 Fire Departments, seven EMS agencies and nine Police Agencies. It handles over 20,000 calls annually in a 1,024 square mile area to 35,820 residents [census 2012]. Lewisburg, WV is the County seat in Greenbrier County and is considered to have a very low crime rate.